It’s been a slow news time now that Black and White have been released in Japan. Not to mention that work hasnt left me with much free time, which is why i havent been playing White very much or updating my little playthrough diary – sorry about that. Anyway, To celebrate the fact that Pokémon Gold and Silver games were released for the Gameboy/Gameboy Colour 10 years ago – Nintendo are handing out the original secret Pokémon, Mew, over wi-fi to HeartGold and SoulSilver. The window is short on this one, so dont forget to download yours. Sorry we’re a couple of days late with this, been kind of a hectic few days personally. The Official HeartGold/SoulSilver pokemon site has announced the latest Wi-Fi event for the 2 games. Starting on July 31st, the Enigma Crystal will be available to download on all American, European and Astraliasia versions of HG and SS. 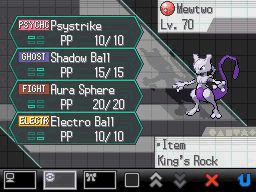 The Enigma Crystal is a key item that will allow you to catch a Latias or Latios depending on your game. After you get the National pokedex in HG/SS and took a vist to the Pokémon fan club building in Vermillion, Latias will start roaming Kanto in HeartGold, while Latios will do the same for players of SoulSilver. The Enigma Crystal is an item that will allow you to catch the other Lati*s that roams your game. By taking the Crystal to the Pewter City Museam, some expert will look at it and turn it into a Soul Dew (an item that goes very well held by a Lati*s) – upon exiting the Museam, Latias will show up if your playing SS while Latios will apear if your on HG. They will then battle you, allowing you to capture them. The Wi-Fi event is available until the 27th August, and the site says you will need to have the National Dex in order to download the Enigma Stone (although I’ll be challenging that statement myself, regardless of the results you will need the national dex in order to do the in game event). EDIT 31st July: Just tried to download the Enigma Stone, I’ve yet to beat Gym 8 so I definatly don’t have the National Dex Yet. You CAN download and pick up the Enigma Stone before you get the National Dex, but obviously you will need the National Dex to take part in the event itself. We’ll bring you more news when we learn it, and dont forget to drop by the Forums and talk all about the latest news on Pokémon, or to give us your thoughts on anything Pokémon Related. 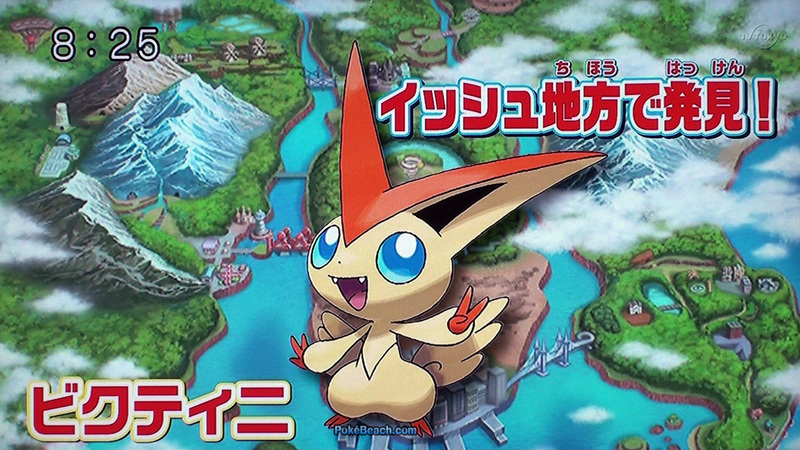 Pokémon Sunday once again reveales a new Pokémon – and by reveal we mean we’ve actually seen this guy before. 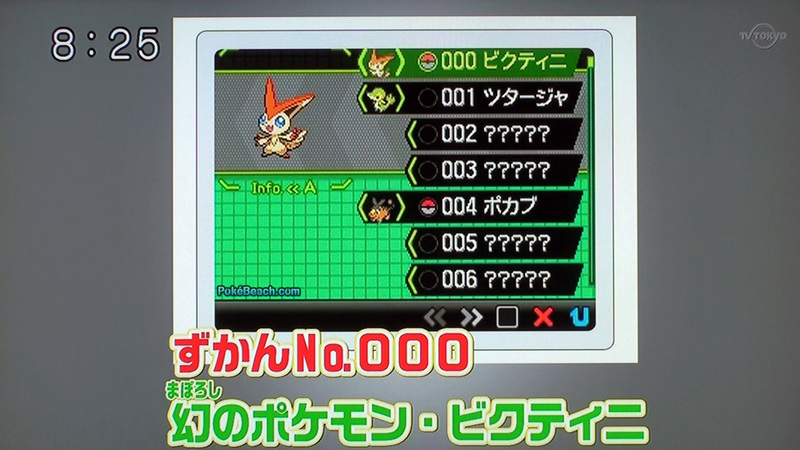 As shown in the above post, Bukutini actually has the Pokédex number 000 in the Isshu dex, coming in before Tsutaja, a first for any event only legendary (who usually appear a the end of the region’s dex). Speaking of it being event only, we know exaclty how to get one too. 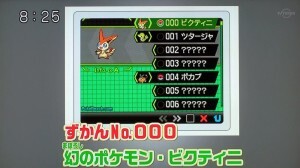 By downloading an item called the Liberty Ticket you will be able to get Victini (possibly through an in game event unlocked by said item). The Liberty Ticket will be available from Black and White’s release on 18th September up till 18th October via Wi-Fi (and the usual Pokemon Center’s and other distrabution points in Japan).